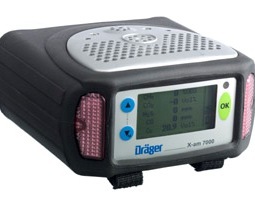 The X-am 7000 provides an innovative solution for the simultaneous and continuous detection of up to five gases. A combination of more than 25 sensors allows flexible solutions to individual monitoring tasks. The X-am 7000 can be equipped with three electrochemical, and two catalytic bead or infrared sensors. The software menu of the X-am 7000 was designed in partnership with our customers making it simple and easy to use. Functions such as TWA and STEL values, as well as functions, like peak hold can be viewed or switched on quickly and with minimal training. A new, flexible goose-neck probe simplifies the search for leaks at e.g. flanges, shut-off devices and valves. In the tracking-mode, the instrument generates an increasing or decreasing rate of beeps, depending on the gas concentration detected. Additional to the built-in dust and splash water protection, the X-am 7000 can be submersed without damage. A specially designed rubber-boot protects the instrument against damage from a drop of 1.5 m (5 ft.). The completely new design of the rechargeable battery block with intelligent charging management guarantees full functionality of the instrument over a period of up to 20 hours (depending on the battery type). An alkaline battery pack is also available. It is the ideal companion in a great number of applications where reliable monitoring of Oxygen, toxic and combustibles gases and vapours in the ambient air is necessary.